A few days back I wrote about the Kund Park and the death of twenty bears due to the floods and survival of only three bears. A viewer of my blog has informed that two leopards, all deers and many species of pheasants along with the bears were also swept away. And as if that was the only damage to the preserved wild life. Today I read that as the flood water is ravaging the Sind province, downstream Sukkur and Kotri barrages, the habitat of the rare Blind Indus Dolphins, the wildlife experts fear that their existence will also be seriously endangered. As the gates of all barrages are being opened and water is let into the link canals, there is a likelihood of these blind creatures being swept away into the canals and smaller distributaries and ultimately succumb to the floods as well. 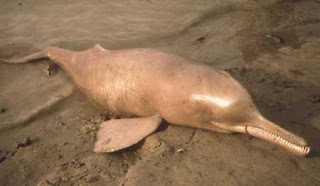 Earlier in 1990s when Indus swelled in to high floods, many blind dolphins were found dead near the canal banks. If this happens, this will be a serious blow to the efforts of the Sind Wildlife Department, Indus Dolphin including Pakistan Wetlands Programme, United Nations Information Centre, World Wildlife Fund (WWF)-Pakistan, International Union for Conservation of Nature (IUCN), working in unison to save these helpless creatures. Besides, the other wildlife like the Hog Deer will also be threatened that abound in the Katcha Forest lands. The Katcha area is badly hit by the floods this year. It will be much after that the water is receded that the actual extent of the damage will be known. However there is a ray of hope, as opined by Dr Akbar, Director of WWF-Pakistan that since Indus is flowing towards the left the effect of the flood will be lesser on the right and dolphins would drift towards the right and even if they slip downstream, they can still swim back after the flood water recedes. Well I wish and pray it to be so, but like all other nature and wildlife lovers, I am keeping my fingers crossed for the time being, hoping for the best and survival of this extremely extinct marine species.